1/1, January 1907-3/1, January 1909. 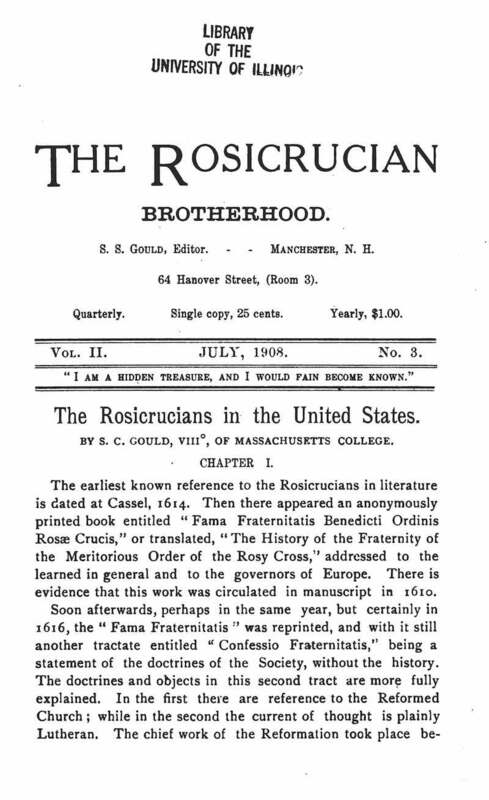 The journal was begun as the The Rosicrucian and Philosopher's Stone and its last issue was entitled the Rosicrucian Brotherhood Quarterly. This was begun by Gould (1840-1909) as a more exclusively occult version of his Notes and Queries, from which it was largely copied, and was probably intended to prepare the groundwork for the Societas Rosicruciana in America that Gould and G. Winslow Plummer ("Khei") were in the process of creating. See the note under Mercury. The journal printed comments on and selections from the works of Godfrey Higgins, Edward Vaughan Kenealy, Albert G. Mackey, Charles H. Mackay (a disciple of Hiram Butler's), W. Wynn Westcott, Alexander Wilder, Robert H. Fryar, P.B. Randolph, John Yarker, and many others. There is a mystery connected with the fate of this magazine. Gould himself published 2/2 of the Rosicrucian Brotherhood in April 1908, and the same month Reuben Swinburne Clymer (1878-1966), then beginning his rise in the occult world, began publishing volume 1, number 1 of his own journal, The Initiates, and subtitled his journal: The Rosicrucian Brotherhood, volume 2, number 6. Clymer continued the double title intermittently for the next year, in the process confusing the volume and issue numbers even further. There is no way to untangle the problem. Gould died on July 19, 1909, and perhaps was infirm for the last year of his life; his Rosicrucian Brotherhood for October 1908 and January 1909 merely reprints his already published list of Arcane Associations that Gould had begun publishing in 1896. Perhaps Clymer appropriated the title or bought the mailing list. While Gould and Clymer shared their Rosicrucian interests and association with Edward H. Brown's Temple of the Rosy Cross and other groups, and advertisements for Clymer's books were prominently featured in Gould's Notes and Queries all throughout 1908, there was no apparent passing of the Rosicrucian torch from Gould to Clymer and no truth in Clymer's later claims that Gould had been a member of his branch of the Rosicrucians. LOC; University of Illinois; University of Minnesota; New Hampshire State Library.